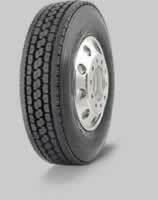 The TY577 Drive Axle tire is designed specifically for the demanding requirements of long haul trucking. Yokohamas industry-leading technologies deliver maximum wear, fuel savings and durability in a drive-axle tire designed to exceed every expectation. With all these technology features, the TY577 will deliver best-in-class performance. Optimal grove shape is wider at the top for enhanced traction, yet narrows at the bottom to prevent stone capture. Funnel-shaped groove wall increases block rigidity for added traction, enhanced resistance against uneven wear and superior ride comfort. STEM-2 Technology minimizes strain for longer casing life.STEM-2 Technology minimizes strain for longer casing life. MC2 Technology reduces rolling resistance for better fuel economy. Extra deep tread wears evenly for long original tread mileage.